Guilt free, easy and delicious recipe alert! 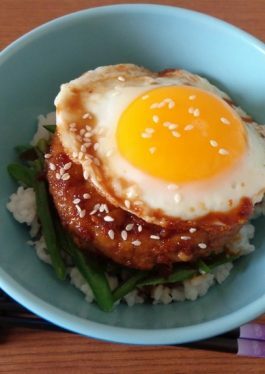 Check out this delicious Honey Lemon Teriyaki Chicken Burger Rice Bowl recipe from VeeTee member Hidemi Walsh and the story behind it: Inspiration came from one of my favorite food, “Three colors rice bowl (Sanshoku Don or Tori Soboro Don)” which is ground chicken cooked with usually soy sauce, sugar, sake and mirin, sweet salty scrambled eggs and blanched green beans over the cooked rice). 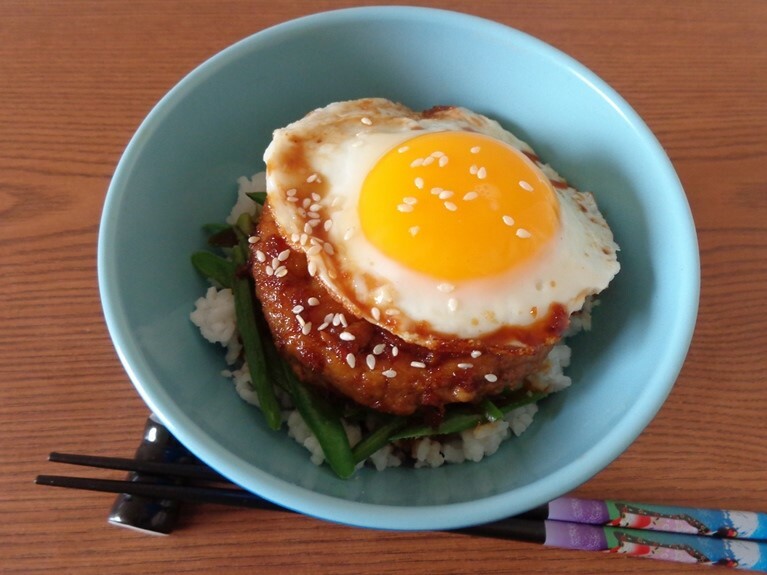 But people in America love burger so I made teriyaki chicken burger with sunny-side-up egg and blanched green beans. Same color but different style which might be more attractive, I think. My teriyaki sauce is made of common ingredients you can find at any grocery stores and added nice acid which enhances your appetite. Guilt free, healthy and delicious burger! And easy to make! 1. Wash green beans and drain. Cook green beans in salted water until crisp tender. Transfer the beans into a colander, rinse under running cold water and drain. Slice the green beans thinly diagonally. 2. Make honey lemon teriyaki sauce. In a shallow saucepan or skillet, stir together honey, soy sauce, lemon juice and ginger. Simmer stirring occasionally until slightly thickened. 3. In a bowl, mix together ground chicken, salt and black pepper to season. Divide the mixture into two and shape each into patty. 4. Heat 1 teaspoon olive oil in a heavy skillet over medium-high. Cook chicken patties until golden brown. Flip, reduce heat to medium and cook until cooked through. Then put patties into the honey lemon teriyaki sauce and coat both sides of patties with the sauce. 5. In a nonstick skillet, heat 1 teaspoon olive oil and crack in eggs. Make sunny-side-up eggs over medium heat until whites are set yet yolks are still soft or your desired doneness. 6. Cook rice following by the package directions. Then divide the rice among two servings and put into each serving bowl. Divide the green beans among two servings and put on the rice. Put 1 patty and 1 egg over the beans. Drizzle the remaining sauce over the top. Sprinkle with sesame seeds over the top.